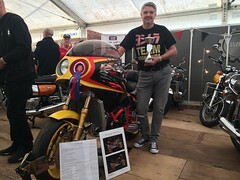 The aim of the Kettle Club is to bring together owners and prospective owners, who share a passion for keeping the Suzuki GT750 'alive' and on the road. Either by: - National rallies, camping weekends, motorcycling events in the UK and Europe or written contributions in our quarterly, quality magazine, the “FLEXI-FLIER.” We also run a very lively Members exclusive Forum. We are genuinely not concerned with the condition of your Suzuki GT750. Whether it is a box of bits, "Rat bike", mint un-restored, restored or special. Whatever condition your GT750 is in, you will be welcome at any of our get togethers. 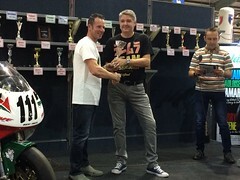 At our National Annual General Meeting known as the "BLUE HAZE RALLY", we hold a competition for members who wish to take part and show their machines, with prizes awarded for all but two of the above categories. The exceptions being “Rat bike” & Box of bits of course. You don’t even have to own a Suzuki GT750 to become a member. We attract members to the Club who have a general interest in the GT range. 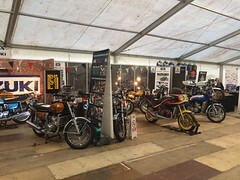 Many of our members also own other bikes ranging from old British iron, to modern Japanese & European super bikes and we don't mind if a member should come along to any of our events, including our AGM/Rally on one of these machines, or by any other type of vehicle, motorised or not; so long as they are Kettle owners at heart!. We can locate limited accommodation/Bed & Breakfast at our more regular camping weekends & rallies for those of you who don’t, can’t or won't do the camping thing. Hell, we even bring the whole family along. So why not bring yours, make a day or a weekend of it and see some Kettles in the wild!